Is there real evidence of heaven or the afterlife? [audio:http://www.truthrevolution.tv/show/TS-0034.mp3]No Flash Support? Use this Audio Player! Dave: Fanciful. They call it imaginary. 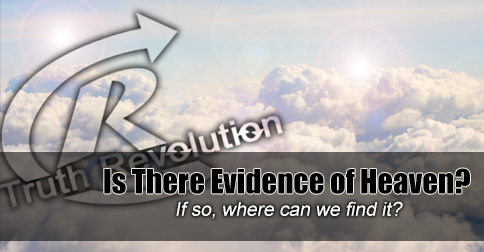 But is there any evidence Heaven is real? who died and came back. Dave: So what is the evidence? DAYS later, he left an empty tomb behind and appeared to his followers. Dave: There is plenty of evidence to his resurrection. the other side is like. And what did he teach about Heaven and Hell? Dave: He taught they were real places. Jeff: And that’s the most important piece of evidence for the reality of Heaven.